This brings us to yesterday at 2 p.m.
Off we go back to this place, the Ministerio Publico, to receive what we are told will be a prepared copy, signed by the MP, ready and waiting for us. We arrive at 2:15 p.m. — well within the alleged work window of 2 p.m. – 3 p.m. when the signer-of-the-police-reports is at work. We get there and the semi-helpful man who took the police report in the morning was there. We walked in and he was making out with his novia; which was seemingly inappropriate given that this is a governmental office and HE IS AT WORK. But then again, given the overall look of the office, I would imagine lascivious activities are permitted onsite. He stops rubbing on his lady friend for a brief moment to offer us his version of customer service and tells us that the MP is in fact there and he’ll bring us the copy in a bit. Go out there and wait. Within 10 minutes the maker-outer brings out the SIGNED COPY of the 4-page police report. It took 3 trips, which I’ve learned is about the average when dealing with this country, but it’s done. I was excited so I asked D. to take a picture of me with the office report. 1.) How long will it take me to get my replacement working visa? I need this badly within 30 or so days so that I can hike it back to La Paz, the capital of our state, to get Vivienne and Lila’s Mexican passports. This is a super-fun annual trip. Note the sarcasm. 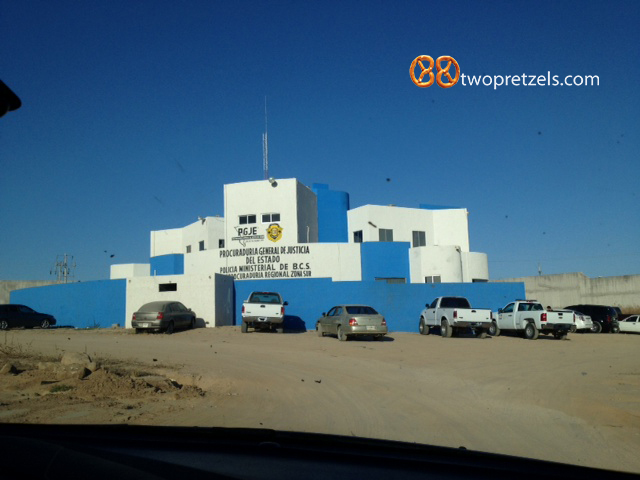 The peeps in La Paz at the passport office LOOK for ways to turn you down and have you return at least twice. Which is not convenient. Not having an original working visa will give them an immediate reason to turn me down. Hence, I need it. 2.) Will my Mexican bank refund me the money that was debited out of my account? Apparently this police report will help entice them. Still, it’s up to them and it’ll take about 30 days for them (this means 90 days) to decide. Holy Moley. I haven't been on the actual computer so I am WAY behind on Walletgate. Glad things are successful for now. No me gusto jerkos who steal things. What an invasion. BY YOUR KIDS. Gross.